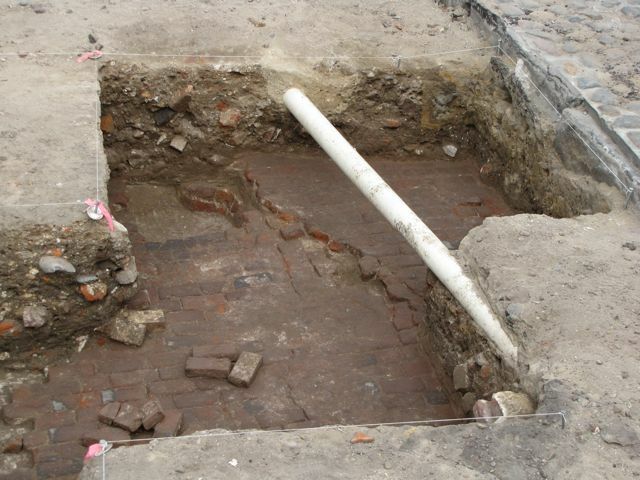 The big goal for today was to get a complete record of the exposed portions of the brick floor of the Lower Market, laid ca. 1786, before the predicted rainstorm arrived. 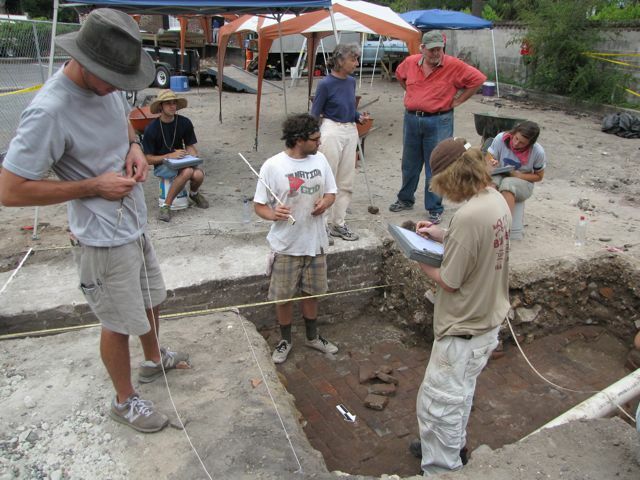 After giving the units a thorough sweeping, the College of Charleston archaeology students and their instructors began the meticulous process of measuring, sketching, and photographing the exposed features. Just as this work was wrapping up, the first band of heavy rain blew in. A few minutes later, however, the rain dissipated and the work resumed. 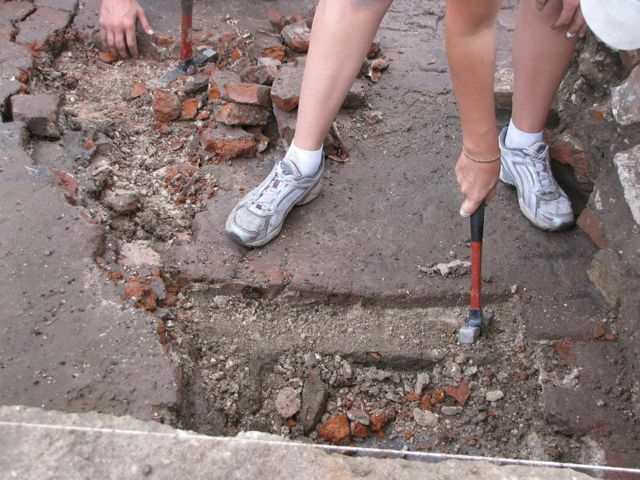 The second task was to carefully remove the brick pavers of the market floor. 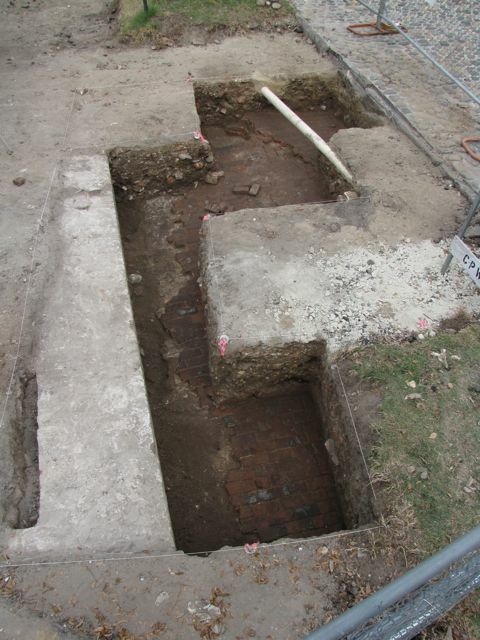 These thin bricks, which were originally laid in mortar, came out rather easily using shovels and small hammers. We are confident that the redan wall will be found just a few inches below the market floor, and are eager to get to it. By the time the brick pavers had been removed, however, the rain returned with a vengeance. 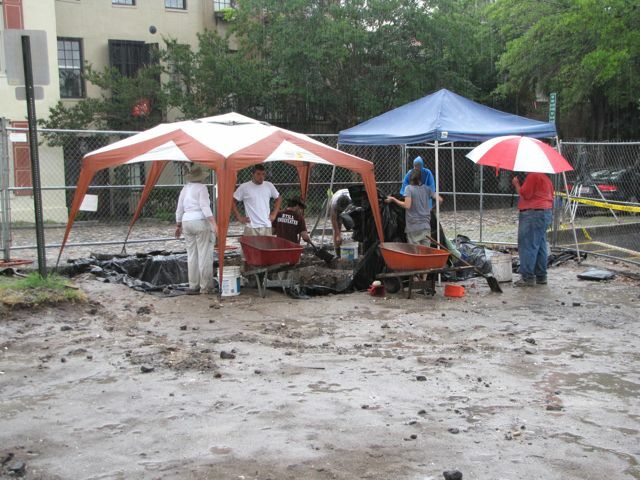 The students quickly covered the dig site with large tarps to protect the excavation and packed up for the day. Despite the inclement weather, the students did manage to locate a few interesting artifacts. 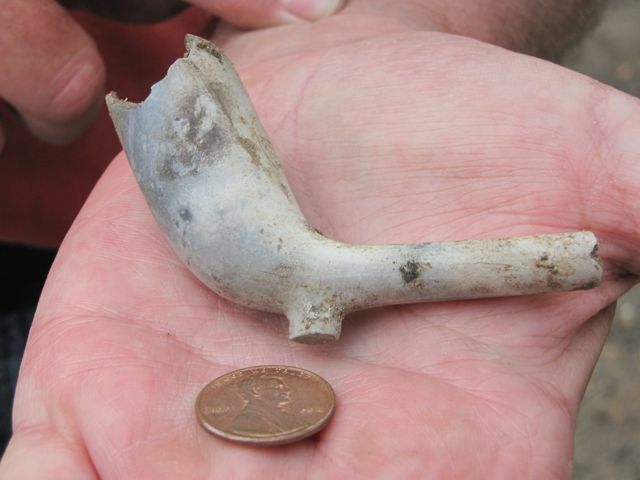 One noteworthy item is a nearly intact clay pipe bowl. Fragments of these disposable smoking implements are commonly found at eighteenth-century sites like ours, but it is rare to find an intact bowl. The maker’s stamp, “T. D.”, is even visible on this one. 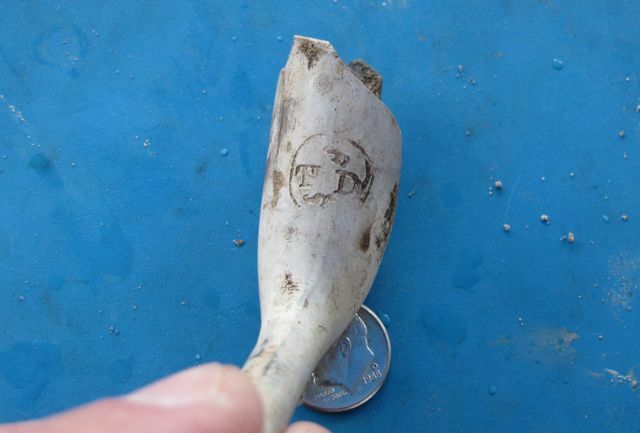 Another interesting find is a fragment of a piece of green Whieldon ware, a type of English ceramic dating from the era 1750–1775. 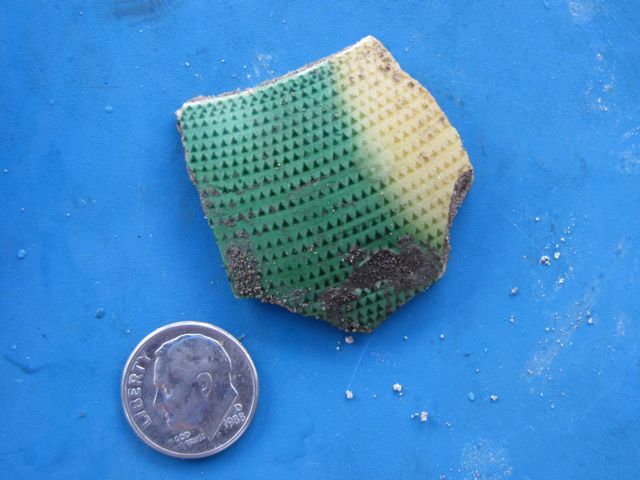 It’s only a small fragment of a larger vessel, but it is a vivid reminder of the colorful utensils that were used in early Charleston. 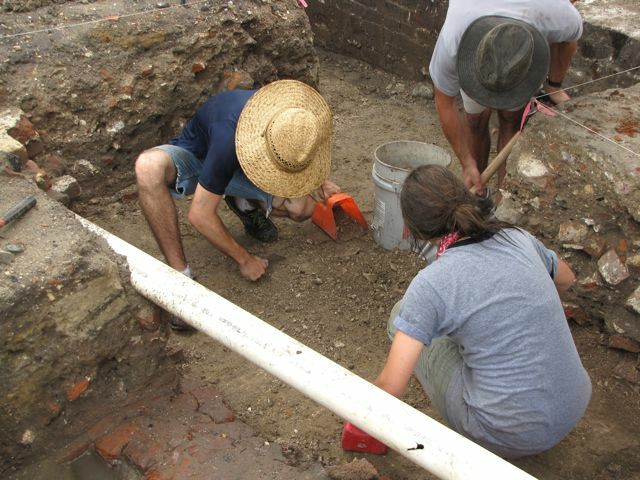 Both of these artifacts, by the way, were found in the thin layer of dirt immediately below the floor of the Lower Market, which was paved over ca. 1784–1786. We dropped by after the rain had stopped to see if work had resumed. It had not, and the dig site had quite a bit of water in it. The tarps were doing their work! There was a group of young women there who asked us to take their picture at the fence. Two of the group had been there in the morning while work was going on and had been excited to bring their friends back to see it also. Maybe they were able to stop back on Friday? They did have info about the website. And the website is great!